Over 4.9 million detachables were sold in the March quarter, a triple-digit growth versus the same period in 2015, said IDC. 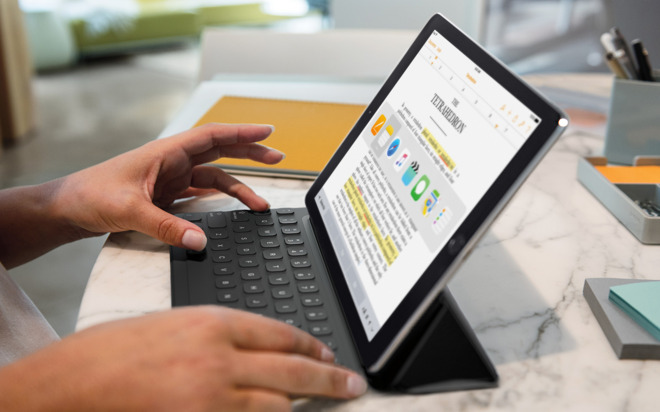 The firm didn't offer a platform-specific breakdown of those numbers, or an exact definition of detachables, although that appears to refer to tablets that have a dedicated method of attaching docks, keyboards, or other accessories —in the case of the iPad Pro, the Smart Connector. 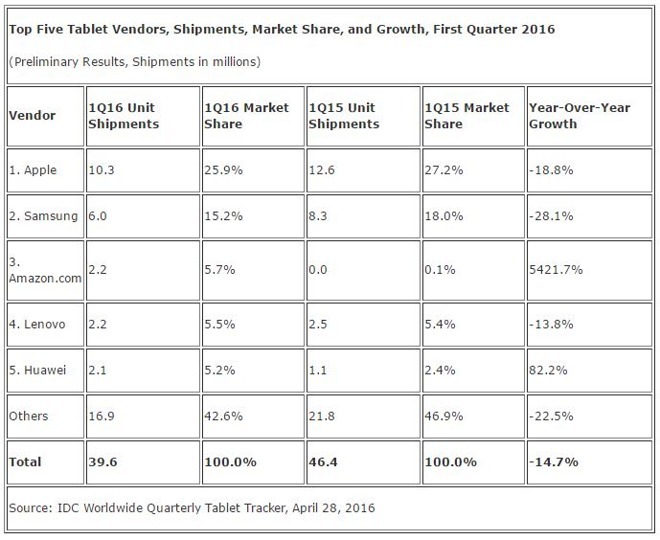 Regular "slate" tablets accounted for 87.6 percent of units sold in the March quarter. That market is said to be sliding towards the low end, which may help vendors like Amazon that simply want to grow their ecosystem, but is said to be pushing the likes of Samsung and Huawei to produce detachables for the sake of keeping up profit margins. The tablet market as a whole reportedly shrank 14.7 percent year-over-year to 39.6 million units. Apple continued to lead with 10.3 million shipments, although its marketshare fell from 27.2 percent to 25.9. Samsung ranked second with 6 million tablets, seeing its share dip from 18 percent to 15.2. In third was Amazon, with 2.2 million units and a 5.7 percent share. IDC speculated that going into the future, iPad sales will be "largely relegated to replacements" of older iPads and PCs, rather than net new additions. Things like the 9.7-inch iPad Pro are said to be "healthy additions," however, and lower $399 pricetag for the iPad Air 2 could spur upgrades by people who still own an iPad 2.